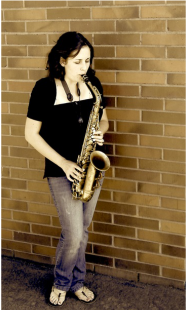 Years of performance, practice, and training make me the ideal teacher for the new saxophonist. My background in music education and saxophone performance compliment my teaching style and create lasting results in a short amount of time. Private lessons are the best way to ensure success no matter what your goals are! Each lesson will be customized to your specific, individual needs. You will learn how to eliminate obstacles in your playing, set goals for yourself, and you won’t believe how fast your playing progresses! You can be confident in your decision to study with me, because you will be learning from an award winning teacher, performer, and composer who regularly has students who win first chair in honor groups, participate in state solo-ensemble competitions, and win scholarships to college music programs. Because of my past success in teaching students, I am confident I can help you succeed with the saxophone. In fact, I am so confident you will hear dramatic improvement in the first 90 days, I am offering you and your child a free, no obligation introductory lesson! SPACE IS LIMITED- SIGN UP TODAY! Contact for your FREE lesson!